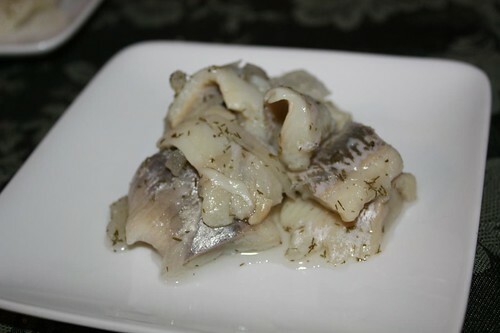 In July of 2008 I tasted this fantastic pickled herring from Blue Hill Bay out of Brooklyn, New York. Sadly it wasn't until April of 2009 that I stumbled upon it in a forum where I could actually purchase it. Sadder even still was that I was unable to find anyone who would enjoy consuming the herring with me until this weekend when Jen's dad was in town. Truth be told, I had forgotten I even had this herring around. I thought that after our trip to Aquavit this summer that Jen would have opened up to having some herring. I was mistaken. Every time the herring would turn up in the fridge I would suggest it to a look of partially masked disgust on Jen's part. Then, on the day after Thanksgiving, Jen's dad discovered the herring in the fridge and I had found my herring buddy. 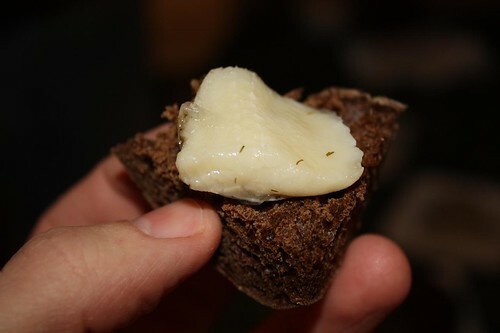 Served on some pumpernickel bagel pieces from Davidovich Bagel & Lox Factory this was the perfect pre-day-after-Thanksgiving treat. The traditional hot turkey sandwiches of Jen's youth require french fries as an accompaniment. 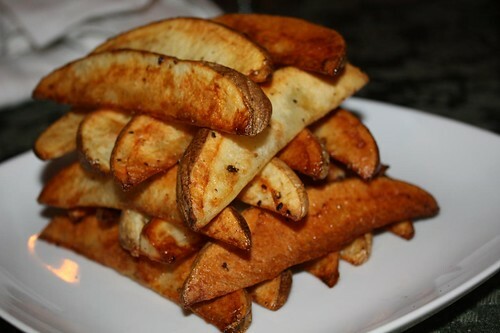 Given that our deep fryer requires $20 of oil to fill for use we opted to once again make potato wedges which I arranged in this Jenga-style presentation. 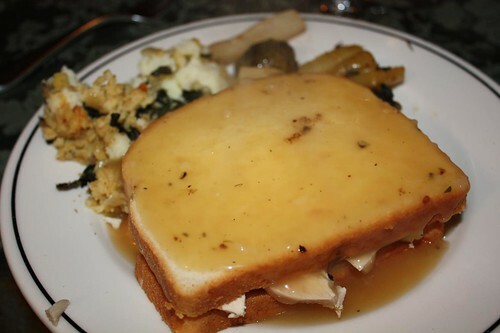 Jen's was a closed turkey sandwich with hot gravy over the top and vegetables on the side. Gary had the idea of using naan as a base (brilliant) but did not trust enough in this innovation that he would eat this exclusively. Thus he also had a plain white bread version as insurance. 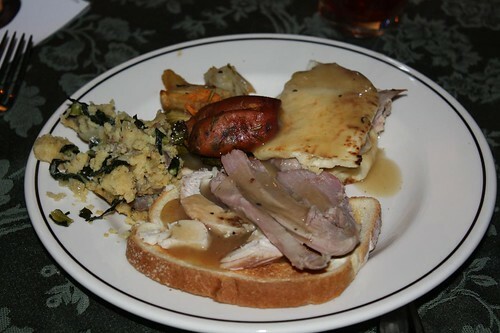 He felt that the turkey should go on the bread with sides and vegetables on the side. I prefer my sandwiches open-faced. 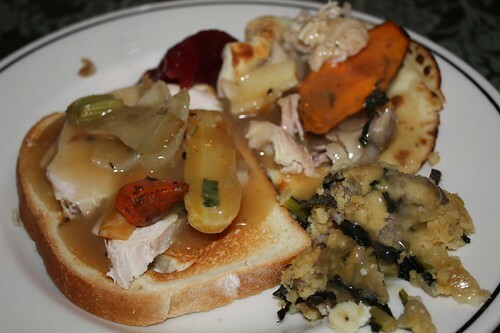 I also prefer my vegetables, stuffing, and everything on top of the bread in one ungodly heap. While I had plenty of faith in the naan idea I also wanted to have the white bread version as well as it is hard to pass on tradition. There's no tradition like a new tradition! It's a naan issue! Hey, anytime you have a problem finding a herring-eating companion, I'm your girl!